Read the entire text of the book here, courtesy of Solid Sharkey. 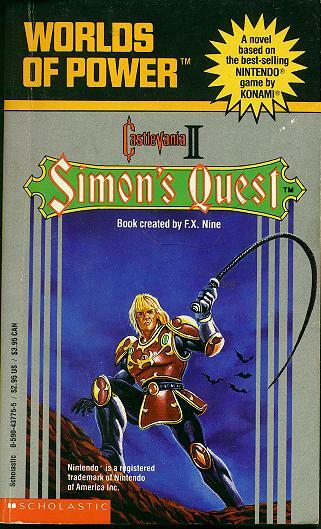 Anyway, instead of many other Worlds of Power books that focus on the storyline and main character, instead it features a kid sucked into Castlevania. This, in itself, is stupid, because other books like Bionic Commando and Metal Gear were a lot more fun when everything was told from the main character, not a whiny suburban adolescent. The plot's the same as the game, except it adds in Simon's lost love, Linda Entwhistle (or something like that) who had been kidnapped by Dracula. Simon and this kid, Tim, wander around Castlevania to find Dracula's body parts and burn them (the ring and nail were dropped in favor of the brain and foot.) See, Simon has 48 hours to destroy Dracula once and for all, otherwise Drac can take over his body. For some reason, this curse makes Simon acts out one of the seven deadly sins (gluttony, for instance, he craves food. Or sloth, where he sleeps despite his time limit.) Drac even tempts the kid. First off, the element of having a foreign kid ruins so much. He's a master Castlevania player, but he doesn't know about everything in real life. All he does is whine and complain about how spooky everything is. Worse yet, he's addicted to chocolate, which he soon loses. Simon acts like a church preacher and give him sermons about being more serious while Tim tries to make Simon a bit more humorous. Don't get me started about the beginning of the book...he gives tips to "the cutest girl in school" on where to buy video games (not even I was that geeky in 8th grade), and escapes from a bully, in the bathroom, through a dimensional portal opened by Simon. Worse yet, Tim defeats Dracula the first time by telling him bad jokes. Come on, who approved this book? Near the end, Tim distracts the Count with a Gameboy (never mentioned up until this point) while Simon whips him. The duo meet a "friendly" monster named Freddy who gives them tips in one of the mansions. Are you seeing the problem here? The following is a quote from the book, just as an example. Thanatos howled with vexation and fury. "Strike him in the chest, Tim! Strike him in the chest!" Tim ran up and hit Thanatos in the chest with a clenched fist. "No!" said Simon, fighting for all he was worth to stay on the creature, who was bucking like a Brahman bull. "With the thorn whip. With the thorn whip, Tim!" Tim stepped back, aimed and let go." The biggest snap of them all! Thanatos gave one more mighty heave, tossing Simon Belmont off once more. However, he did not look as though he were about to charge Tim any longer. In fact, the Master of Death looked like he was very ill, or about to explode. Have I tortured you enough? Was that truly awful?? Well, my advice is to read the book (if you can find it) and laugh at how awful someone can desecrate anything Castlevania. The whole thing is full of morals like not eating too much chocolates, dealing with things, and being serious, which don't belong in a silly book based on a video game.